Accra, June 10, GNA - Dansoman-based Liberty Professionals on Thursday gave premiership new entrants, Real Sportive a baptism of fire with a 4-0 thrashing when they played in their second league game at the Accra Sports Stadium. Liberty scored twice in both halves to record their first victory and resurrected the hopes of their teeming fans after their 3-0 defeat to Accra Hearts of Oak in their league opener. The Dansoman lads in spite of their unimpressive display recorded their first two goals through Kwame Darko in a spell of four minutes. Darko raced deep into the visitors defence haven taken a through ball from the middle and unleashed a feeble shot which beat inexperienced goalkeeper, Stephen Adams in post for the debutants with only six minutes of play. He was on hand again when he finished off with a low grounder four minutes later following an interchange of passes between him and the top striker, David Boateng for Liberty's second goal. Sportive became unsettled by the early goals but managed to hold their midfield intact and shuffled well with beautiful exchanges creating few anxious moments for the Liberty lads but lacked the finishing power and experience to cause any havoc. The Tema based team brought on goalkeeper Laud Quartey for Adams and the closest they came to scoring was when Dodzi Shadrak's free kick kissed the post and bounced back into play with Liberty's goalie, Kotei Blankson completely beaten to end the first half. 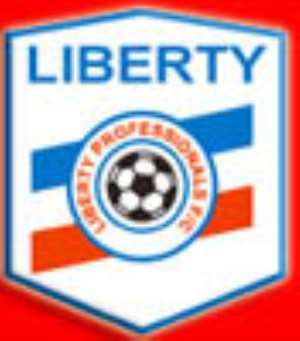 Liberty's Jonathan Quartey pushed the game beyond the reach of the visitors when he stroke home the third gaol only a minute into the second half when he capitalized on sloppy marking from the Sportive defenders. It was however substitute Eric Bekoe who sealed the doom of the visitors with the fourth goal on the stroke of time to lift the club from the bottom of the Zone A's league table to the number three position.